Vinyl Window Perf & Lettering Help Vapt Vupt Janitorial Advertise 24/7! No matter the size of your business, one of the most effective ways for you to build your clientele is mobile advertising. Vinyl graphics have the lowest cost per thousand impressions of any type of marketing. Once you install vinyl window perf, you can count on millions of impressions over the course of the year. 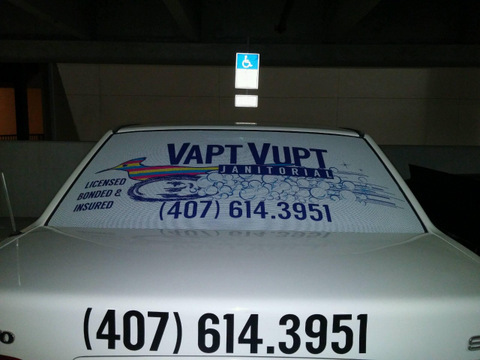 Vapt Vupt Janitorial realized this, so they contacted the experts at Citrus Sign Studio to begin advertising with vehicle window perf in Clermont, FL. Advertise 24/7 with vinyl window perf! Located on State Route 50 in Clermont, Vapt Vupt Janitorial prides itself on providing timely cleaning services for spaces big and small as well as commercial properties and private residences. They serve Seminole, Lake, Osceola, and Orange Counties; The Villages area; and all of the Orlando area. Vapt Vupt, which is the name for a roadrunner in Brazil, offers family friendly, environmentally friendly, non-toxic, pet safe cleaning services. We especially like that they supply free housecleaning to women with cancer. When a business that is so focused on giving back to the community came to us for vehicle vinyl lettering Clermont, FL would notice, we jumped at the chance to help. Owner Rodolfo Szanto wanted an eye catching design. Essentially, he wanted to make sure his phone was ringing! Brand and advertise with window perf and vinyl lettering! For this project, we were working with a Volvo S70. 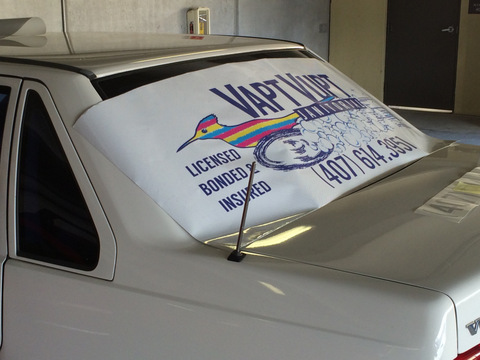 For the design, we used Vapt Vupt’s secondary logo of the roadrunner in the rear window. This is what people who are stuck in traffic will see. On each of the backseat windows, there are images of happy maids ready to get down to work. 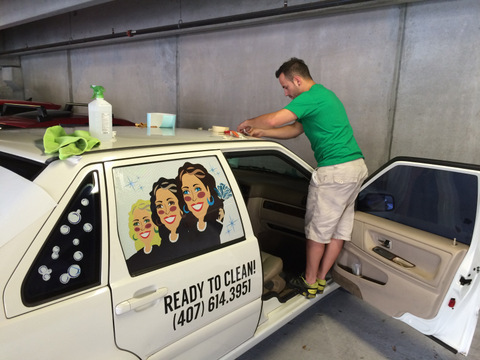 All of these graphics were rendered using vinyl window perf, so the driver can still see outside of these windows. 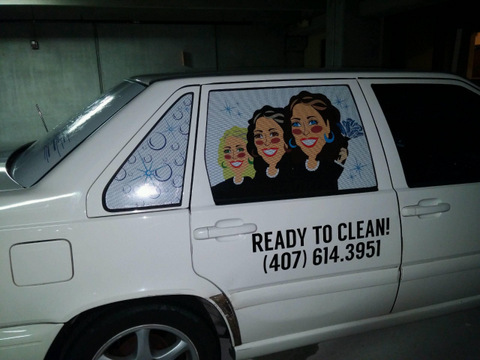 Under the smiling ladies, black vinyl lettering displays the slogan “READY TO CLEAN!” as well as the company’s phone number. We worked with Vapt Vupt’s schedule to professionally install their new graphics. Since the installation, Rodolfo has contacted us to let us know that the graphics are working. He regularly sees camera flashes as passersby take pictures of his new vinyl window perf. Ask us about adding affordable vinyl window perf! If you think your marketing has to stop at your car windows, you have another thing coming. 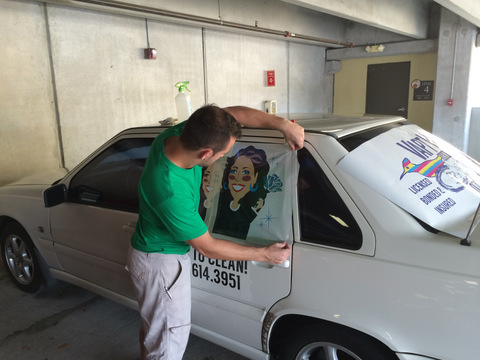 With vinyl window perf, you can still see out of your automobile’s windows while using all of your car’s surface area for advertising. By installing these graphics on the back of your fleet, you can turn rush hour into a sales opportunity. When it comes to vinyl vehicle lettering, it used to be that black lettering was the only thing available. While that is still a viable option, there is now more variety. These days, you can get vinyl lettering in neon, metallic, matte, standard, and reflective options. Additionally, you can get whatever, sizes, colors, and fonts you want. Does your business have a fleet of company vehicles? Have you neglected to take advantage of the marketing opportunities they can provide? If so, contact the friendly experts at Citrus Sign Studio for a free quote and consultation on vinyl window perf and lettering.